Google Canada today revealed more than 130 Canadian cities to be viewed in the 3D environment of Google street view mode. Among those cities are Bolton, Orangeville and surprisingly many parts of Caledon, Ontario. Even the smaller the towns of Caledon Village, Caledon East, Alton & Mono Mills are mapped as well as many of the main roads through all of Caledon. Mapping by the famous google camera car was done this past summer, I actually saw it in person in Orangeville one weekend. Street View is a free feature in Google Maps, Google Earth, and Google Maps for mobile. It was first launched in 2007 and it now includes imagery from 18 countries in North America, Europe, Asia, and Latin America. To start exploring, simply visit maps.google.ca and zoom in to the lowest level or drag the orange “Pegman” icon from the left side of the map onto a blue-lined street. Google Street View has also become a great tool for real estate, it provides people an easy way to show what is around the house that is for sale in the neighbourhood, gives people a better idea of a property and area instead of just blindly showing up. However on the other side of things Google has come under fire for privacy concerns surrounding the service and has addressed those issues by blurring out the faces of people in the photos, as well as licence plates on vehicles. 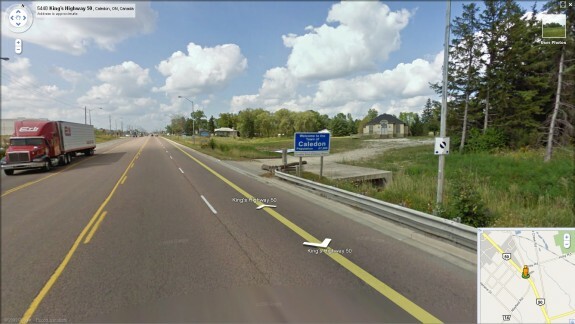 If you see anything of interest in the Caledon area on Google Maps Street View please leave a comment here.